SOURCE: Nameplates for Industry, Inc.
NEW BEDFORD, MA--(Marketwire - Feb 19, 2013) - Nameplates For Industry, Inc. manufactures a full line of product identification labels that can be made from various substrates and special adhesives to create a watertight seal. Custom engineered, they can incorporate adhesives that bond to difficult surfaces such as LSE plastic, powder-coated metal or wood, and contours. NFi Water-Resistant and Chemical-Resistant Labels feature subsurface printing to protect the images and data and can be produced in multiple colors, shapes, and sizes, including barcodes and serial numbers on a variety of materials. Capable of withstanding water, detergents and chemicals, they are suitable for application on equipment that is subject to frequent wash-down or exposure to chemicals. 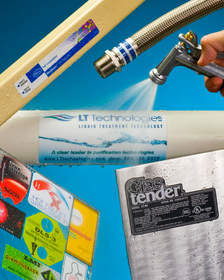 Made from conformable and rigid materials including polyester, PVC, and Lexan® polycarbonate, with adhesives engineered to match the application, NFi Water-Resistant and Chemical-Resistant Product ID Labels can also be manufactured to conform to NEMA 4 requirements. NFi Water-Resistant Labels and Chemical-Resistant Labels are priced according to construction, size, and quantity. Price quotations and representative free samples are available upon request. About this company Nameplates for Industry, Inc.
NFi Water-Resistant and Chemical-Resistant Labels are ideal for application on equipment that is subject to frequent wash-down or exposure to chemicals.